To find photos, traveler tips, ratings, and more tourist information, read Geneva trip planner . Cairo, Egypt to Geneva is an approximately 7-hour flight. You can also drive; or do a combination of car and ferry. Due to the time zone difference, you'll gain 1 hour traveling from Cairo to Geneva. Traveling from Cairo in November, things will get cooler in Geneva: highs are around 11°C and lows about 3°C. Finish your sightseeing early on the 23rd (Fri) to allow enough time to take a train to Zermatt. On the 24th (Sat), take your sightseeing to a higher altitude at Hohbalmen, take your sightseeing to a higher altitude at The Matterhorn, and then take in the architecture and atmosphere at Intercontinental Church Society. On your second day here, make a trip to Photopoint Kirchbrucke bridge, fly down the slopes at Matterhorn Ski Paradise, and then get great views at Gornergrat. 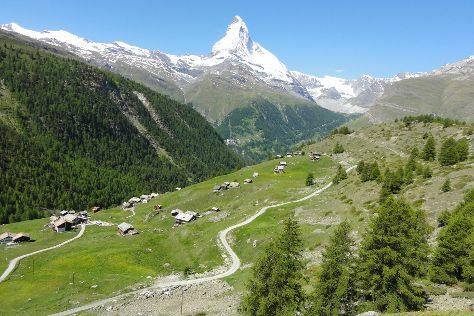 To find traveler tips, maps, photos, and other tourist information, read Zermatt trip itinerary maker site . Traveling by train from Geneva to Zermatt takes 4 hours. Cap off your sightseeing on the 25th (Sun) early enough to catch the train to Interlaken. Start off your visit on the 26th (Mon): stroll through Hohematte Park, fly like a bird with a parasailing or paragliding tour, then take in the awesome beauty at Schynige Platte, and finally take in the dramatic natural features at Aletsch Glacier. Keep things going the next day: cruise along BOHAG Helikopterrundflug, take your sightseeing to a higher altitude at Harderkulm, then look for gifts at Buchhandlung Boedeli, and finally head outdoors with Bumblebee Hanggliding Interlaken. Plan trip to Interlaken with our itinerary maker to find out where to go and what to do. You can take a train from Zermatt to Interlaken in 3 hours. Expect a daytime high around 8°C in November, and nighttime lows around 0°C. Finish up your sightseeing early on the 27th (Tue) so you can go by car to Zurich. Venture out of the city with trips to Lucerne (Mt Pilatus, Lion Monument, & more). There's much more to do: explore the activities along Lake Zurich, contemplate in the serene atmosphere at Fraumünster Church, shop like a local with Bahnhofstrasse, and pause for some serene contemplation at Grossmunster. For reviews, where to stay, photos, and tourist information, you can read our Zurich trip planner . You can drive from Interlaken to Zurich in 2 hours. Alternatively, you can take a shuttle; or take a train. In November, daytime highs in Zurich are 10°C, while nighttime lows are 3°C. Finish your sightseeing early on the 30th (Fri) so you can travel back home.